Sorry, again and again, that I haven't been posting much. Work is hard, and I shut my finger in the car door and fractured it, so I have to wear this silly little splint for four to five weeks. Don't worry, it doesn't hurt too badly. And it's my left hand, which isn't my dominant hand, but typing is hard! Anyway, now that that's out of the way, go make this. This recipe is another variation of the NY Times olive oil granola recipe I posted about last year, which is so incredible. I added in some flaxseed, a bunch of chia seeds, sunflower seeds, and cut down the sugar a little. It's still pretty gooey with the honey replacing the maple syrup in the original recipe, but I like it like that. I added flaxseed for fiber, chia for omegas/protein/essential fatty acids/more fiber, making this granola a little healthier. Plus I cut down on the sugar a little bit. That's healthy, right? I had to literally drag myself away from the pan to take these pictures, and then to eat dinner. I'm fighting right now to stay on the couch long enough to type this post before I run back and shove the rest into my mouth. Preheat the oven to 300. Stir together everything except the fruit, spread out on a cookie sheet, and bake for about 30 minutes, stirring every 10. I've found that the 45 in the original recipe is too long and I end up with over-cooked granola, and it's terribly sad. After the granola is cooked, stir in the fruit and chia while the granola is still hot, so they gets a bit of the granola coating. Let cool further, and store in an air tight container. Have you tried making this recipe using applesauce instead of olive oil like mentioned in david lebovitz's blog. 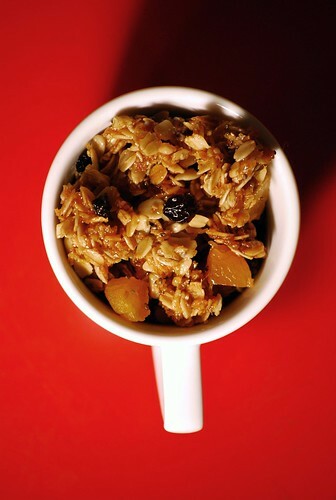 the applesauce really lighten ups the granola. 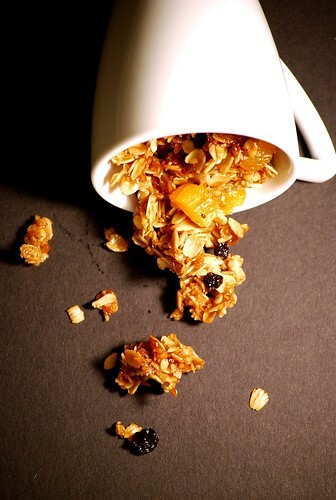 love home made granola..wonderful recipe but i would remove dried fruits for me coz i dont really enjoy them...and ouchh!! big time..hope ur finger is ok now! !that must hve hurt real bad.. I've been making granola with maple syrup using an Ellie Kreiger recipe. The great thing is it's made with only 1 1/2 tsp oil because it's made in an ActiFry (a new kitchen appliance I got for Christmas). I like some of the added ingredients you have and will try out some new combinations. Next up -- GF granola bars! Sounds yummy - any idea how long it lasts (in terms of freshness as opposed to how long it takes to eat all of it)? There are only two of us in the house (and I'm not sure that he would eat the granola, he's a picky eater sometimes). I would be so bummed about the finger - sorry! This sounds so tasty. Love granola. Can you help me figure out why the link to all previous recipes no longer works?? Hey! Your link to your previous recipes isn't working....help! I need those! YUM this looks great! Beautiful picture too.